jQuery.mb.containerPlus is going to have a new life. jQuery.mb.containerPlus is one of the most appreciated jquery plug-in of mine (more than 25.000 downloads till now) and I decided it was time to radically update the code. Skins doesn’t use images anymore and are completely realized via CSS3. This means you can easily modify and personalize containers for your usage. 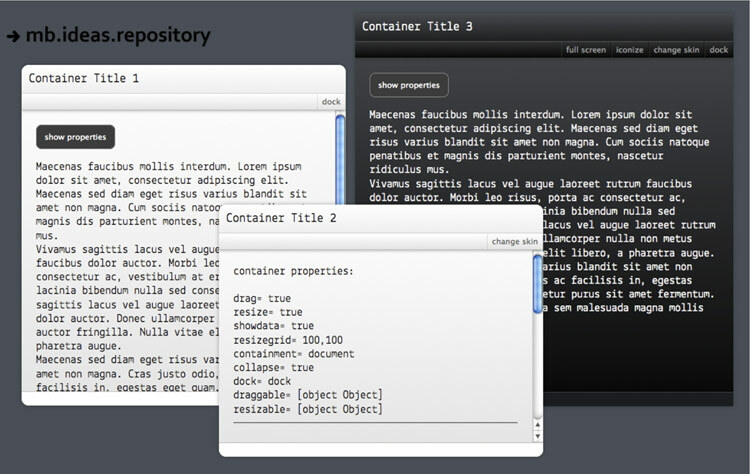 You can drag and resize containers also on your iPad. This method ( $.containerize.addMethod(“yourMethod”,fn) ) inject functionalities you can use for your container as, for example, adding a full screen behaviour. Removed the dependence to the jQuery.metadata.js plugin. Now it uses the DATA attribute to store container properties. I’m working to fix all the bugs and to implement all the features used in the previous release. Hope to make it public soon. Thank you for that great script!!! I use it for a help button by now, but would like to have it in a select option range too. I have a function which converts a sidebar with ul > li > link groups to a selectbar with select option group elements. Is it anyhow possible to fire these option value links to pop up in a 3.0 modal container? Are you continue to allow the use of icons? I really like the iconize/ icon image for the item as well as using my own. Never mind i just read your previous posts. Wow! Matteo! I am sure you have heard this complement already 1000000000 times, (and you deserve everyone of them 🙂 but truly, this plugin is great!!!! 1. how can i keep it closed on page load? (to open it manually). 2. is it possible to add image icons to the container (left-top corner)? 3. is it possible to open one of several containers modal mode? As you see, i am newbie, and i will appreciate any help, if you can. There you’ll find the previous version and the mb.containerPlus 3.0 one. 2. In the demo you can see how I placed an icon on the top left corner. 3. The first container in the demo file now opens as modal; as you can see from the code I pushed a new method and added a data attribute to the first container. Be careful, I changed the name of the js and CSS file!! p.s. Your work is very beautiful, design-wise and code-wise! when i add data-close=true, the position (or margin) of mbc_content inside the container changes. It happens only in some browsers like FireFox and IE. I tried to correct it in CSS but unsuccessfully. Is there any way for you to advise me how to correct it? You can create a div element and add this style in, then there will have stripes as background. Similar patterns can also made using CSS3 gradients. The dock into menu feature is really good, also the iconize function to left menu could have the icons appear and then when hover shoots out the text to say what the window is. Also fullscreen is useful maybe could appear under the top menu. The scrolling is definitely more stable than containerplus. Box shadow on click also a nice touch. Also the use of n=both e.stopPropagation(); and e.preventDefault(); on buttons in demo is redundant. For the grab: Yes, there should be something that tells you it is resizable; I’m trying not to use images for the layout; instead I’m going to make a font with all icons needed for the interface and use it as @font-face. For the custom scrollbar: I think that this could be a plugin; this new version of container+ allow the implementation of extra behaviours and this could be one; having it by default would weigh down the page. more documentation will be available soon. Excellent work Matteo! I look forward to the public release.